1. Swimming costumes. 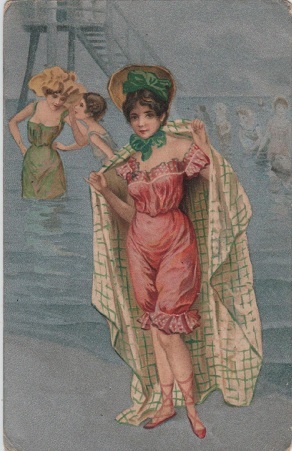 Why can’t I wear a Victorian bathing suit? Why do I have to have my pasty, sun-starved, resembles-a-pound-of-tripe thighs on show? Why does my saggy, kangaroo pouch of a tummy have to be on display for everyone’s scrutiny. Why does some perfect specimen of supermodel have to walk out of the changing rooms and into the pool just in front of me, emerging poolside seconds before to display me at my absolute worst just by direct comparison? Please, some fashionista take pity on me and bring back the full body bathing suit, I’m sure you’d be the saviour of self-conscious women everywhere. 2. Why does every lifeguard have to be a sneering teenage boy? And can’t they have some sort of mandatory training that enables them to prevent themselves retching when a particularly lardy specimen of womanhood passes by their big tall stool thingy? All that’s lacking is a scoreboard and my humiliation would be complete. 4. Chlorine. Otherwise known as chemical warfare. 5. Lockers. Everything I own will be stolen whilst I’m in the pool, my identity will be cloned by some drugs baron in Columbia and I’ll be on Crimewatch next week. Just as I dish up fishfingers to my kids, my cloned alterego will be conducting an illegal military coup in a small, barely known principality just left of Tanzania. Just after the washing up is done, a crack team of SAS soldiers will swing into my house and take me to a top security military prison. No amount of pleading ‘I was watching Eastenders when the president was being assassinated’ will persuade them of my innocence. So there it is…. swimming. This entry was posted in Tennant's Teasers and tagged bathing suits, body hangups, swimming. Bookmark the permalink.